At present there are NO visitor facilities at Sharavogue Bog SAC. Most of the bog is in private ownership so unsupervised visits are not advised, encouraged or allowed. The LIFE project will host open days on Sharavogue over the duration of the project, and local community events and and guided tours will take place on the bog in the near future. There is plenty to do and plenty to see in the area close to Sharavogue Bog, and the hidden gem that is Birr is only a short distance away. 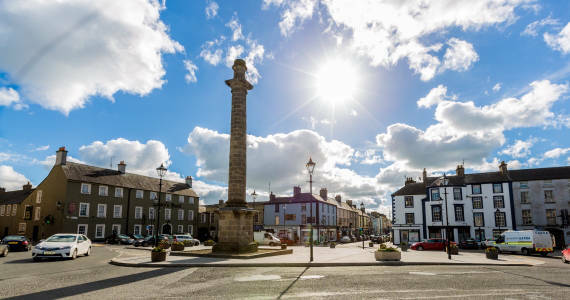 Formerly known as Parsonstown, Birr is one of the most historic and picturesque towns in Ireland – a jewel in the midlands – and is well worth a visit. Birr is a designated Heritage Town with a carefully preserved Georgian heritage, of wide streets and elegant buildings. It is an ideal centre for touring the midlands, with everything from Birr Castle to the ‘Leviathan of Parsonstown’ (an astronomical telescope – at one stage the world’s biggest) to the Georgian Mills to the Workhouse to the parks along the River Camcor vying to keep you in the town. The first ever All-Ireland Hurling Final was played at Hoare’s Field in Birr (now a Tesco site) in 1888 between Tipperary and Galway. Birr Castle has become one of Ireland’s must-see attractions in recent years. As Birr Castle Gardens and Science Centre, it is a place where history, nature and science collide. Allow yourself plenty of time to explore Birr Castle’s spectacular Gardens and fascinating Science Centre. For many years the Parsons family have invited the public to explore one of the most extraordinary places in Ireland. Created over generations it is an environmental and scientific time capsule, and if you are on the ‘Ireland’s Ancient East’ tour, it is a place you cannot miss. 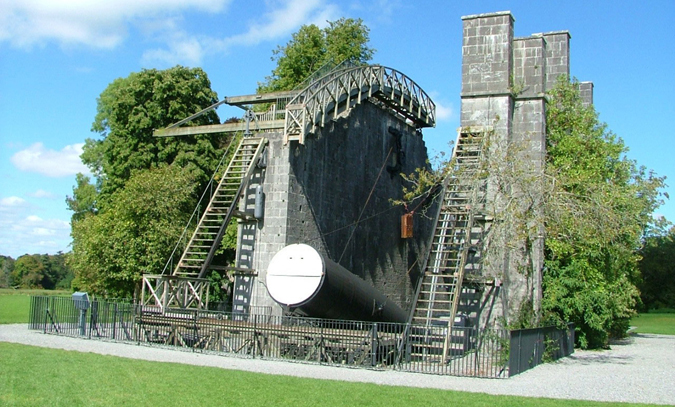 At the Science Centre, you travel back to the time when Birr Castle was a hub of scientific discovery and innovation, the third Earl was building the great telescope and his wife Mary was practising her photography. Later, their son Charles Parsons was inventing the steam turbine, which changed the face of seafaring and led to the invention of the jet engine. The interactive centre reveals the wonders of early photography, engineering and astronomy with a special emphasis on the brilliant design and assembly of the world famous Great Telescope. The Great Telescope, designed and built by the third Earl of Rosse in the early 1840s, it was the largest telescope in the world. With this telescope, he discovered the spiral nature of some of the galaxies, and from 1845-1914, anyone wishing to witness this phenomenon had to come to Birr. This ‘leviathan’ as it is named, remains in the centre of the Demesne as Ireland’s greatest scientific wonder and represents a masterpiece of human creative genius – you can’t miss it! Of course, kids also love the Castle. All you budding knights and princesses will find themselves lost in a world of imagination in the epic Treehouse Adventure Area. 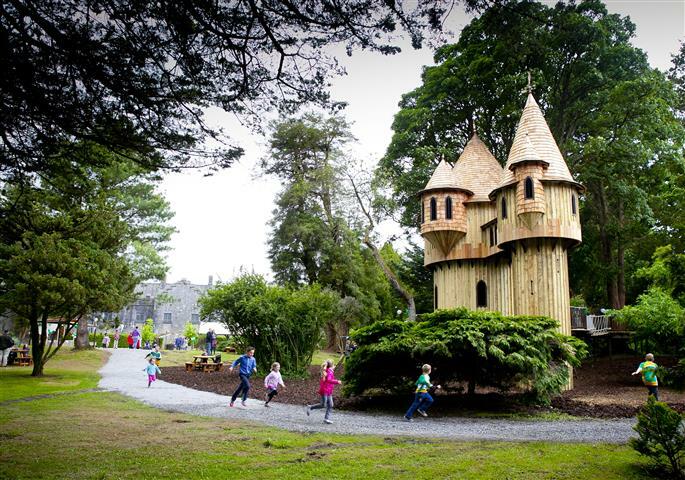 The playground features Ireland’s largest treehouse along with a bouncy pillow, sandpits and a hobbit hut. And while they’re busy in the Treehouse Adventure area, you deserve a coffee and a browse around the gift shop – and everyone’s happy! In July/early August the town comes alive as it celebrates our collective past with the highly-rated Birr Vintage Week, one of the great Irish town festivals. 2018 will be the 50th year of the Festival and the celebrations planned for the 50th anniversary should be spectacular! 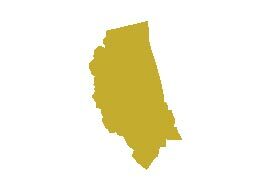 Offaly County Council have an extensive website www.offaly.ie which features excellent Heritage and Arts and Culture coverage.